“Oh wow… No way! !” was Tatiana Rayvich’s first thought when she won. 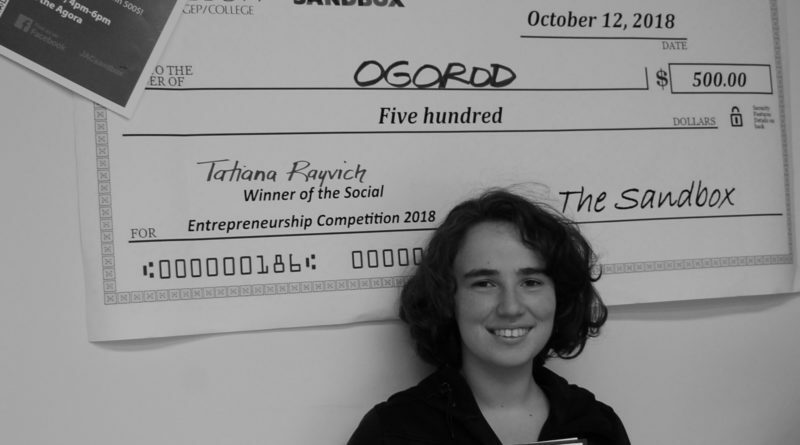 On October 12th, the Sandbox’s Entrepreneurship Pitch Competition awarded a 500$ startup investment to Tatiana Rayvich and her rooftop gardening project: Ogorod. Her inspirations come from daily problems: “I live in Verdun, and in that area there are a lot of flat, unused roofs […] Therefore I came up with a project that can make these roofs more accessible.” This was all possible thanks to the hardworking organizers: Noémi Blom, Tara Walker and Mary Rupnik. Charlie Gordon, one of the competitors shared that “the Sandbox committee was very resourceful and encouraging throughout the entirety of the competition. Even after the challenge, they still wish to give support in any way they can”, referencing his experience with his Non-Profit Circus entertainment company, Tupiq A.C.T. (Arctic Circus Troupe), which is named in reference to Cirque du Soleil’s Big Tops. His initiatives “hopes […] to educate the public about Inuit traditions and lifestyle on the [Northern coast of Québec and Nunavut and wishing] to break any stereotypes about the Inuit and replace those with knowledge and passion for our culture”. Sandbox’s hard work paid off as Rayvich feels “very hopeful for the project now that it won the pitch competition. The extra support is crucial to get this project started up and running”. Elizabeth Yasa, Co-President of JAC’s Business Case Competition Club, and one of the panel judges, states that “the Sandbox Pitch Initiative is a great way to get students involved, and to show them that they are more than capable of effecting change on both smaller and large scale”.